We’d love your help. Let us know what’s wrong with this preview of The Legend of Bagger Vance by Steven Pressfield. Written in the spirit of Bernard Malamud's The Natural and sharing the magic of the celebrated Kevin Costner film Field of Dreams, Steven Pressfield's first novel - never before published in the UK - reveals the true nature of the game. Page-turning, spellbinding and affecting, it is a novel for golfers and non-golfers alike - a story in which the search for the Authentic Swing becomes a metaphor for the search for the Authentic Self. To ask other readers questions about The Legend of Bagger Vance, please sign up. I had no idea that movie was based on a book. I'm not a golfing fanatic, I don't watch it on tv, but I was on the edge of my seat reading about the golf match that is played in the book. The book is not at all like the film starring Matt Damon and Will Smith as Junah and Baggar Vance respectively. The book highlights the main themes treated in the film, but it goes a lot further. Golf is a game where you play against yourself, against your mind. Golf represents the war that rages inside each one of us. Each golfer is a warrior, fighting the v I'm not a golfing fanatic, I don't watch it on tv, but I was on the edge of my seat reading about the golf match that is played in the book. Golf is a game where you play against yourself, against your mind. Golf represents the war that rages inside each one of us. Each golfer is a warrior, fighting the voice and the false beliefs in him that make him doubt himself, doubt his worth, doubt his reason for being there. The book also contains the message that all warriors know that war proves our race's failure. If we can fight one another, and justify it because we see ourselves as separate from one another, then we have failed. The most honourable thing a warrior can do is move forward and be true to who he is, despite others wanting him to be someone and something else. The warrior who chooses to heal, to make whole, to put back together, is the most noble of all. Despite the serious subject and theme, there are some very funny passages throughout that will have you chuckling. For any golfer, there are certain irrefutable truths. Integrity is a truth. Respect, competitiveness, focus, peace, and countless others are all integral pieces to golf's puzzle. I have had the very real privilege of knowing the game of golf- not how to play it, or the rules, but to KNOW it. I have seen what it does to me. When I am on the secluded fairway with a club in hand, the green grass speaks to me, sharing life's lessons. This is when I pray. This is when I see the world as it should be- For any golfer, there are certain irrefutable truths. Integrity is a truth. Respect, competitiveness, focus, peace, and countless others are all integral pieces to golf's puzzle. I have had the very real privilege of knowing the game of golf- not how to play it, or the rules, but to KNOW it. I have seen what it does to me. When I am on the secluded fairway with a club in hand, the green grass speaks to me, sharing life's lessons. This is when I pray. This is when I see the world as it should be- in complete harmony, purity, honesty. My faith in mankind is restored, because all I can see around me is the most perfect game on earth. For any golfer, there are certain movies that you will have seen. At the forefront of those is The Legend of Bagger Vance. Being one of my favorite movies of all time, it surprised me that I hadn't read the book on which it was based. Pulling out my trusty Nook, I pressed the "shop" button, and entered those amazing combination of words into the search bar. Success! The Legend of Bagger Vance, by Steven Pressfield. Excited as I was to dive into it, I thought back and remembered that the best time to watch the film is at night. Golf becomes somewhat angelic at night. There is a peace knowing that the courses come alive when nobody is there, so, I immerse myself in the movie when there is no possibility of driving out and diluting that hallowed ground. I decided to practice that same discipline when it came to reading the novel. So, several impatient hours later, I clicked on the first page. I was hooked. The words jumped out at me, fading every aspect of life around me into sheer blankness. I was at a golf course. I could see it, I could feel it. The Nook in my hand was not an ereader, it was a golf club. More specifically, my Titleist putter that served me for many years, that I aptly named Discipline. It has recently been retired, and in trying to learn my new putters existence, I have named it after one of the course holes listed in the book. A little off topic, I know, but as you read this book, golf transcends a game, a sport, an activity. It is living, breathing, and utterly you. It changes itself to understand you, to bring out the absolute best and absolute worst. This book explains those truths in almost panoramic detail. Narrated from the aging lips of a man who was there in 1931, there to witness a one day event, a golf match, between the two heroes of the day, Walter Hagen and Bobby Jones, and a local hero, tormented by his past and after a several year sabbatical from the game, agrees to test his talents against those gods of golf in order to help revive a dying post-Depression Savannah, Georgia. The moral of the story isn't the match itself, which was brilliant, not even of Bagger Vance, the local hero's caddie, the namesake of the book. Rather it is the self discovery of generations of people, of battles past and future, literally retold through the divine lips of a mysterious mentor, Vance, and the absolute truths that can only be reached through a club in the hand, a ball on the grass, and a pin in the distance. 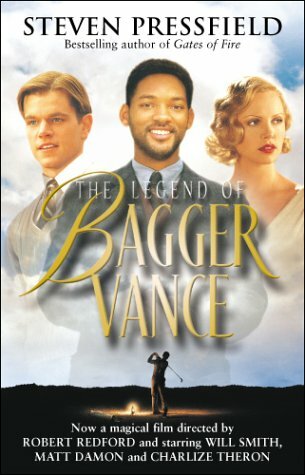 The 2000 film The Legend of Bagger Vance, was loosely based on the Gita, with golf taking the place of war (though the hero has been traumatized by World War I). In the film, the Krishna figure (played by Will Smith) describes to [Ar]Junuh (Matt Damon), for whom he is the caddie (charioteer), the feeling of karma without kama (pure-action, without thought for results) as playing in the zone, a great analogy. First off, I like to golf. It's fun: get some sunshine, hit a few balls, make a few good shots, make a lot of bad shots, buy drinks from the golf cart girl, and grab a sandwich at the turn. Drive, curse, rough, curse, sand, curse, putt, curse, tap in. There's nothing overly complicated about it, in my opinion. What I don't like about golf is the cult around it, of which this book is trying to be an epistle. I understand that some people go all out: 90 hole weekend, trips to St. Andrew's, etc. Tha First off, I like to golf. It's fun: get some sunshine, hit a few balls, make a few good shots, make a lot of bad shots, buy drinks from the golf cart girl, and grab a sandwich at the turn. Drive, curse, rough, curse, sand, curse, putt, curse, tap in. There's nothing overly complicated about it, in my opinion. What I don't like about golf is the cult around it, of which this book is trying to be an epistle. I understand that some people go all out: 90 hole weekend, trips to St. Andrew's, etc. That's ok, though, because there's nothing wrong with having a hobby (as long as said hobby doesn't include injuring others or animals needlessly). What's not ok, is this idea that golf is some sort of "higher plane" activity; that it's a metaphor for life or finding the Field or the Authentic Swing or any other such nonsense. It's a game. Sometimes even a sport. That's it. What the whole cult smacks of is a giant rationalization: in order to justify to ourselves and our spouses and our children why we spend hundreds -- sometimes thousands -- on equipment to spend hours away from home walking across acres and acres of land that deep down inside we realize could probably be put to better use, we need to give golf a *higher meaning*. Frankly, I don't buy it. I play golf to have a good time, and everyone else should to ... why else play it? "The Legend of Bagger Vance" by Steven Pressfield tees up a message of greater meaning and knocks a long drive down the fairway straight to the pin. The book, which is exquisitely written, discusses the fact that golf is a "higher plane" activity. It makes the point golf is a sport of the gods. It brings you closer to the divine. It is the only sport where the golfer has to judge himself. If he makes an error, the onus is on him to call the penalty. It is a sport where you become one with nature "The Legend of Bagger Vance" by Steven Pressfield tees up a message of greater meaning and knocks a long drive down the fairway straight to the pin. The book, which is exquisitely written, discusses the fact that golf is a "higher plane" activity. It makes the point golf is a sport of the gods. It brings you closer to the divine. It is the only sport where the golfer has to judge himself. If he makes an error, the onus is on him to call the penalty. It is a sport where you become one with nature on courses carved out of the land. Pressfield writes of finding the "authentic swing," which is the representation of your true self. In it he says all the knowledge a person needs can be found in the hands as they grip the club. He wrote that one must play golf, as one must play the game of life, with abandon. Hold nothing back and give it your all. This spoke to me. He makes the claim that there are multiple existences occurring simultaneously, and our true self, guiding by our hands and grip on our world, finds the existence we are meant to live and drives us forward, both literally and figuratively. Essentially, Pressfield writes "Bagger Vance" to describe golf as a metaphor for life. In life, as in golf, integrity, respect, competitiveness, focus, and peace are key components. The story centers on a golfer who is struggling to find meaning in his life by the narrator telling the story of another golfer who was struggling to find meaning in his life. All three of the primary characters — the narrator, the current golfer and the past golfer — are all influenced by the mysterious caddie, Bagger Vance. Vance shows all the players "the field," which is the dimension of the world where all the possible existences live. He shows them how to give themselves to the game, which is to give themselves to life. In the story, Vance is described to be a god, or God Himself. He tells all the players that he will always be with them. When they are in their darkest hour of need, he will be by their side. He lives in all times. He has experienced everything. He is experience everything. The allusions to God are strong, and the message is clear — trust in God and everything will be OK.
As I've said before, I am a big fan of Pressfield, in so much as I've read him. He inspires me, and "The Legend of Bagger Vance" didn't fail to sink the inspirational putt. It showed me to stop over thinking things. I need to live, not worry. I need to trust in God that everything will be OK, and I need to give everything to all that I do. I shouldn't hold back. I give this book 5 out of 5 Stars. Anyone who is interested in golf will be enthralled. The suspense is intense. Pressfield masterfully paints a picture of the 36 holes of golf that are played. He gives the right amount of detail without bogging down the story. The question of who Bagger Vance is, as well as how the golf match turns out, kept me turning page after page. (I aspire to write as well.) Likewise, even if you aren't a golf fan, the message of the book will strike a nerve. Golf is war. War is hell. Golf is hell? Would that the point of this novel was as simple as that transitive property! Sadly, it's not, and I was frustrated in my search for the author's elusive meaning. The novel recounts a 36-hole golf match between Bobby Jones and Walter Hagen, devised to elevate Savannah out of it's 1931 Depression-era slump. The competition takes place on Krewe Island, a stone's throw from Skidaway, a piece of land demolished in a storm during 1938 - save for the 18th hole, a Golf is war. War is hell. Golf is hell? Would that the point of this novel was as simple as that transitive property! Sadly, it's not, and I was frustrated in my search for the author's elusive meaning. The novel recounts a 36-hole golf match between Bobby Jones and Walter Hagen, devised to elevate Savannah out of it's 1931 Depression-era slump. The competition takes place on Krewe Island, a stone's throw from Skidaway, a piece of land demolished in a storm during 1938 - save for the 18th hole, aptly named "Valor", which survived the floods. In additional to the two known champions, a third competitor is found in a local man, Junah, a decorated war hero who routinely seeks solace at the bottom of a bottle. Savannah born and bred, he will represent a city still smarting from the Confederacy's defeat in the Civil War. Accompanying him is his caddie, Bagger Vance, a black man who commands respect and stands equal in an era that would not likely allow it. He has mystical powers and control over Junah, which include getting his golfer out on the links absent a drying-out period. Who is this guy? No spoilers here - I won't say how the match goes, but I'm sure most readers will not be surprised. The author has taken on the ambitious task of weaving philosophy into the game of golf, and, mysticism aside, there are some gems to be found. Most of the novel contains long and detailed passages about doglegs, bunkers, and scoops - if you play, you will likely understand and absorb those sections, with a clear image in your mind of how each of the holes, and the action, is laid, and played, out. If you don't play, you won't learn much here, and you may be frustrated having to search through the jargon for the kernels of wisdom Bagger bestows upon Junah and 10-year-old tag-along, Hardy. I've loved the movie and recently found a copy of the book so I was looking forward to reading this. The book, as always, tells of details that would never make it in a movie and those details add a certain level of enjoyment but the book is much more of a magical realism/spiritual quest story than the movie. The movie was lovingly adapted from the book and that attention shows in a first rate film. This is one of those rare cases where I can't decide if I like the movie or the book version bette I've loved the movie and recently found a copy of the book so I was looking forward to reading this. The book, as always, tells of details that would never make it in a movie and those details add a certain level of enjoyment but the book is much more of a magical realism/spiritual quest story than the movie. The movie was lovingly adapted from the book and that attention shows in a first rate film. This is one of those rare cases where I can't decide if I like the movie or the book version better. The basic storyline of a WWI veteran/hero who'd been a local "golden boy" scion of the southern gentry who damaged by his experiences in the war who finds himself representing local honor in a golf match against Walter Hagan and Bobby Jones is all there but the "third generation" character of young black man who's hearing the story for the first time is missing from the movie. This character, the addition of the changing role of race in the south, and the jarring attitude of a modern day young man when contrasyted to the genteel 1930's of the match all add something to the in-depth story but would have made the film version too muddled. One interesting note about my experience reading this book... I read part of it while having lunch at the Coney Island restaurant in St. Petersburg. It's been there since 1926 and has the perfect atmosphere for complementing a story about the 1930's. One of the countermen, happened to see what I was reading and made a point of telling me that he'd read the book as well, and thought that it was the best thing he'd ever read. Given his disheveled appearance and the worn Harley Davidson T-shirt I saw under his counter apron I'd not have guessed that he was an avid reader and certainly not a golf fan. 'It's not about golf,' said the student to this teacher. At that moment, 'It's not about golf,' said the student to this teacher. At that moment, I determined to read this book. So, this was my first free choice of a book this summer and I enjoyed it. First things first. You do not have to understand golf to understand the book. The golf match is merely the vehicle to move the story forward. When Bagger Vance encourages his pupil to find his 'authentic swing' I simply inserted my own experiences with baseball to understand the feeling. Secondly, the book is full of eastern philosophy. It's an interesting dichotomy - the American South during the Great Depression and Hinduism. Search 'Bhagavid-Gita, Bagger Vance' on the search engine of your choice and you'll find it laid out quite nicely on many, many sites. So, my final grade: 4 stars. Not Pressfield's best work but still quite interesting and well done. This text either awakened or reawakened something in me; I am not sure which. It reminded me - made me remember. Read it. Steven Pressfield is a master at his craft. The Legend of Bagger Vance is easily in my top 10 favorite novels of all time. My question is how could a book this good, be made into such a mediocre movie? Especially when it's starring Will Smith, Matt Damon, and Charlize Theron. I think it was the difference in tone. The book was much deeper and asked tough questions like what can we do in order to uncover and discover our true and authentic self. The movie was lighter in tone and didn't spend enou Steven Pressfield is a master at his craft. The Legend of Bagger Vance is easily in my top 10 favorite novels of all time. My question is how could a book this good, be made into such a mediocre movie? Especially when it's starring Will Smith, Matt Damon, and Charlize Theron. I think it was the difference in tone. The book was much deeper and asked tough questions like what can we do in order to uncover and discover our true and authentic self. The movie was lighter in tone and didn't spend enough time exploring Bagger Vance's philosophy on the game of golf and life. Well worth reading. This review has been hidden because it contains spoilers. To view it, click here. This just didn't work for me. Pressfield is a talented wordsmith, but if I had never seen the film, I would have been thoroughly lost and confused. Most of the book is the replay of a fictional golf match, so anyone who loves the game and understands all the mechanics of the sport will be hugely entertained. This is quite cerebral and there is much to ponder here about discovering our true authentic self. There are references to the holiness of sport and some fascinating dialogue about the "myst This just didn't work for me. Pressfield is a talented wordsmith, but if I had never seen the film, I would have been thoroughly lost and confused. I hate seeing the movie before reading the book, but I saw this movie years ago-- so long ago that I'd forgotten the plot, or lack thereof. I really enjoy Steven Pressfield's writing-- it glides smoothly down the page without drawing attention to itself or stalling. I would have enjoyed it more if the book contained less technical information about the game of golf. I know that's stupid, because it's a golf book, but I did get a little bogged down and found my attention wandering when one of the I hate seeing the movie before reading the book, but I saw this movie years ago-- so long ago that I'd forgotten the plot, or lack thereof. I really enjoy Steven Pressfield's writing-- it glides smoothly down the page without drawing attention to itself or stalling. I would have enjoyed it more if the book contained less technical information about the game of golf. I know that's stupid, because it's a golf book, but I did get a little bogged down and found my attention wandering when one of the characters described a particular hole in depth. On the other side of the coin, the character of Bagger Vance has to be one of the most unique and fascinating in all of modern literature. Is he God? Or is he the god of Golf? Or just a guardian angel? Or just a crazy old man? I love the way he is written and left unfinished, as though the reader must struggle to the truth by him/herself. Although they were two completely different stories, this is one of those rare occasions (The Shawshank Redemption comes to mind) when the book and movie do not match but both are superbly told stories. I wouldn't change either and I feel uplifted by the two. The book is far more supernatural and spiritual than the movie and (given my own skepticism and atheism) I was surprised to find that I enjoyed this fictional tale immensely. On previous occassions, I have tried reading books with similar th Although they were two completely different stories, this is one of those rare occasions (The Shawshank Redemption comes to mind) when the book and movie do not match but both are superbly told stories. I wouldn't change either and I feel uplifted by the two. The book is far more supernatural and spiritual than the movie and (given my own skepticism and atheism) I was surprised to find that I enjoyed this fictional tale immensely. On previous occassions, I have tried reading books with similar themes and they've always fallen short. Until now, I chalked it up to my own personal doubts and agnosticism. One of my favorite books of all-time! It pains me that the cover has been changed because a lot of people will judge the book by the movie which was terrible. If they had stuck with early rumors and rolled with Morgan Freeman and Robert Redford in the main roles rather than trying to hook a young audience with Will Smith and Matt Damon who are great in other roles, they might have had a shot, but like a lot of bad movie adaptations this one will deter some people from reading the book. Don't let One of my favorite books of all-time! It pains me that the cover has been changed because a lot of people will judge the book by the movie which was terrible. If they had stuck with early rumors and rolled with Morgan Freeman and Robert Redford in the main roles rather than trying to hook a young audience with Will Smith and Matt Damon who are great in other roles, they might have had a shot, but like a lot of bad movie adaptations this one will deter some people from reading the book. Don't let it. Life is about action; about following through. It is also the search for our authentic self, or if you're a golfer, for your authentic swing! If you've lost your authentic self, it can be found...same with your authentic swing! This book is based, in huge part, on the hindu scripture "the bhagavad gita" and has many spiritual, moral, and personal lessons to teach us. Describing it doesn't do it justice. You have to read it for yourself to understand. Don't let the golf angle put you off. If you l Life is about action; about following through. It is also the search for our authentic self, or if you're a golfer, for your authentic swing! If you've lost your authentic self, it can be found...same with your authentic swing! I am not a fan of golf, but I appreciated and greatly like this book. This book could be about cabinet making or washing windows and it would still be a great read. Some people may object to the eastern mysticism, but I think that speaks more of them than this book. Also, the movie was a two star effort with four star actors and this book is so much more. Please, do not let the movie stop anyone from reading the book. This would easily be my favorite book about golf if not for HP's little red book. This is another one of those book so much better than the movie to me. Though I like the movie this book had so much more depth especially about the stuff that main character was going through. Never thought I'd like a book with golf as it's plot, but this is such a lovely book. The metaphor is wonderful and the story moves along so smoothy. Highly recommend. Loved this book--and I don't even like golf! I finished this one 3 weeks ago. Second time I've read it and still a great read. The book, The Legend of Bagger Vance by Steven Pressfield, is a book about golf along with lots of psychological and spiritual advice. This book goes deeper than just the rules about golf and about life. It puts things you wouldn't normally think about into perspective. It teaches you not just how to master fears in golf, but in life also. We must learn to control our fears and what we hold in our heads in not just in golf but also in how we live our lives. The main character, Rannulph Junuh, w The book, The Legend of Bagger Vance by Steven Pressfield, is a book about golf along with lots of psychological and spiritual advice. This book goes deeper than just the rules about golf and about life. It puts things you wouldn't normally think about into perspective. It teaches you not just how to master fears in golf, but in life also. We must learn to control our fears and what we hold in our heads in not just in golf but also in how we live our lives. The main character, Rannulph Junuh, was a great golfer until he was drafted into World War I. When he want off to war his squadron was tragically defeated and this hurt him mentally because he felt like it was all his fault. All but two people, including him, were killed in his squadron. When he returned from the war he felt there was no reason to live. He would spend his days drinking, gambling and not interacting with any of the folks in town, even Adele who was at one point his fiancé. Another one of the main characters was Bagger Vance. In the movie when Junuh was hitting balls into the dark he seemed to just come out of nowhere, in reality in book the he was said to be his mentor and long time friend. Another one of the characters is Hardy, who was also the narrator of the book. Hardy became close with Junuh and became his forecaddie. The theme for this book would be to never give up on something you love and believe in yourself. “Believe you can and you are halfway.”(Theadore Roosevelt) In the book Junuh didn't believe in himself, so he he didn't believe in his golf game nor did he believe in life itself. There were two main conflicts in this book. One was that he didn't believe in himself and his own abilities. Another one was the conflict between he and the other golfers for the prize money. The strong characters of, Junuh and Bagger, and the conflict of not only the game but of life are the reasons I love the book so much. This book has taught many things about golf and most importantly life. It taught that in golf it is not all about skill, but it is all in the head whether you believe you can do it or not. Not only does it talk about golf and life it all brings in spirituality. In the book people question, who is Bagger Vance? At the end of the book, when Hardy is all grown, he sees Bagger once again. He has not aged a day and was still caddying and giving advice to Hardy and his grandson, Michael. Was Bagger a God? Was he an angel? These are the reasons why I liked this book and here's why I think you should read it. During the Great Depression in 1931 there was Krewe Island off the shore of Savannah, Georgia. People here wanted to seek a bright light out of the Depression in which golf was the deciding factor. Therefore, a 36 hole battle was set between two impeccable golfers of their time, Bobby Jones and Walter Hagen. Another feature to the competition will be Rannulph Junah shooting right beside the widely known golfers. He agreed to compete by an informal invitation. His past didn’t help his case of avoiding the decision; he is the best golfer in all Savannah. Junah was also a war hero, but now he has returned with Bagger Vance, the caddie, the mentor, and the magician. He’s been with Junah since his arrival. Vance carries the secrets of the game of life and golf that Junah becomes eager to seek out. Vance knows the game from head to toe, forwards and backwards. The pinnacle of game is to find that one authentic swing. Every golfer has that one authentic swing. This 36 hole match is not about who’s the best at the game; it’s a match to find what is really in a person and how many stand alone with authentic qualities. Everything was meant to be. I have given this book a 10 out of 10 in the sense of how intriguing the storyline is. Pressfield wrote this page-turner that enraptures a reader in the novel. He writes as though the reader is watching the match from the boundaries wanting more. Pressfield writes in so much detail and presents great scenery in the text. I could depict everything that was happening during each moment. He also provides a teaching tone to the text which is written well and effectively. He supports a problem or obstruction in the story with some sort of dialogue including wisdom or a line with a deeper meaning. He makes the story relatable to not only golfers but people searching what is inside of them. The story flows nicely and creates a good climax with events building up to that point. From the start of the novel I could sense there was going to be an exhilarating finish at the end. His descriptions of characters are detailed because of his great word choice. Pressfield’s themes of inner discovery and authenticity were clear throughout the text. He used characters effectively to demonstrate his themes through action and dialogue. He balanced the story well with drama, dialogue, and background information. Nothing was a mistake in his novel, and everything was right where it should be. The novel was very well written from start to finish. During the great depression, georgia socialite adele invergordon, announces a publicity gathering golf match between some of the greatest golfers of the era. The match will take place at her struggling families golf course. One local professional whose career was derailed by world war 1 will be competing in the event, after being persuaded by bagger vance, which will be his caddie. Bagger vance is trying to coach him back into the great golfer that he once was. I find the story very relatable be During the great depression, georgia socialite adele invergordon, announces a publicity gathering golf match between some of the greatest golfers of the era. The match will take place at her struggling families golf course. One local professional whose career was derailed by world war 1 will be competing in the event, after being persuaded by bagger vance, which will be his caddie. Bagger vance is trying to coach him back into the great golfer that he once was. I find the story very relatable because caddies are not just the people that carry your clubs in a match. A caddie is a person that you grow close to and they help you on and off the course, they help coach you during matches and they also make you think about different aspects of things. Me as a golfer, I can personally say that golf is a game that teaches great life lessons. There are many things that you can learn from the game and i think this book does a good job of conveying this point. I like this book a lot. I also enjoyed the movie, but the book does describe some things better than the movie does. In the movie, it was hard for me to tell that Junnah was in world war 1. The book describes this very well and in depth. My favorite part is when they are playing in the match, it might just be how I enjoy the game but I like to pay close attention to everything that happens while they play, there are many good lines and advice that occurs while the match is in progress. I would fully recommend this book to anybody that enjoys the game of golf. Anyone that likes a book that is described so well that it makes it seem like it is biography or nonfiction would love this book. While i was reading,I honestly thought that the book was nonfiction because of how well described everything was and how real all the events felt. I'm not into the "spirituality" undertones in this book, and I don't play golf (even though I live on a golf course...does that MEAN something? like a giant mountain of mashed potatoes? BE the potato mountain. BE). I'm not into Eastern hyperplane-crypto-mystic-lalalaland stuff. I don't believe in reincarnation or multiple lives or anything else like that, and Pressfield _appears_ to be fascinated by that concept. It is a little annoying, but it was easy to ignore. I still enjoyed the book despit I'm not into the "spirituality" undertones in this book, and I don't play golf (even though I live on a golf course...does that MEAN something? like a giant mountain of mashed potatoes? BE the potato mountain. BE). I'm not into Eastern hyperplane-crypto-mystic-lalalaland stuff. I don't believe in reincarnation or multiple lives or anything else like that, and Pressfield _appears_ to be fascinated by that concept. It is a little annoying, but it was easy to ignore. I still enjoyed the book despite the fact that it reads like a radio announcer describing a golf game for half the time and like an LSD trip the other half. For those who are sensitive to such things, there are some profanities and "crude" sections, but they are easily skipped. Anyway, the thing I did like that Pressfield seems to talk about everywhere he writes and that I really needed to hear, was to get rid of our crap. To strip ourselves bare, and to just do it. Fight the resistance (the evil empire, especially within ourselves). We are often our own worst enemy. I can relate to that, see truth in that. Although he may not want to be in the same company (not sure), part of his message that really resonated I also see in one of my favorite religious writers, the great Catholic writer, Lorenzo Scupoli. Scupoli basically says, "Fight or Die." That's my mantra. Everyday. Pick yourself up and begin again. We are in a battle.